Soay is an island just off the south coast of Skye. It is occasionally considered part of the Small Isles. The main settlement is Mol-chlach. Low lying, unlike its neighbours Skye and Rum, the highest point is Beinn Bhreac at just over 140m. The name derives from Old Norse so-øy meaning "Sheep Island". 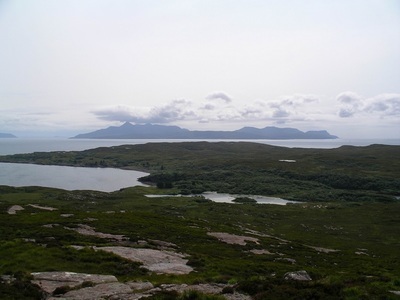 The main bay Camas nan Gall, meaning Bay of Foreigners, is probably named after the Norse invaders, after whom the Hebrides (Na h-Innse Gall) are also named. In 1944, author Gavin Maxwell bought the island and established an unsuccessful factory to process shark oil from basking sharks, which he wrote about in his book Harpoon at a Venture. Unfortunately, this venture lead to a serious drop in the numbers of these animals living in the surrounding seas from which they have yet to recover. 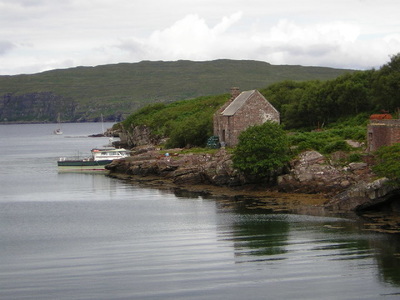 Previously mainly Scottish Gaelic, most of the population was evacuated to Mull on 20th June 1953, since which the island has been almost uninhabited. Currently owned by Dr Nicholas Martin the only family still resident on Soay is that of Oliver and Donita Davies. Oliver has lived on Soay for over 40 years and fishes from his boat 'The Golden Isles' landing his catch three times a week at Elgol. Donita hails from the Orkneys and before her marriage was the islands school teacher. The family who have two children own their croft and are entitled to buy from Dr Martin their share of the common grazings. Trip To Soay - Interesting page which details a trip to Soay. Includes a couple of fascinating photographs as well as some brief history of the island. Bella Jane Boat Trips - If you fancy a trip to Soay then unless you own your own boat the best chance is to see if the people at Bella Jane can help you out.